Posted Breed: American Staffordshire Terrier. LEO came to us as an owner surrender when his family could no longer care for him. He is a friendly boy that will grow to be medium/large size. He knows sit and takes treats gently. He loves to play with toys and will make a great companion. Please come visit the animals at EASEL Animal Rescue League, behind the Ewing Municipal Building at 4 Jake Garzio Drive, Ewing. Adoption hours are every day from 12-3. Overview: The American Staffordshire Terrier is often called "all-American" dog. The breed is loyal and brave, making it a great family pet. Colors: Any solid or partial color, but more than 80% white. Black & tan or liver are less preferred. Coat: Hair is short and shiny. Character: American Staffordshire Terriers are loyal and tenacious. They make great watch dogs and can be quite domineering over other dogs. Temperament: This breed gets along fine with cats or other pets, as long as proper socialization has taken place early on. They make good family dogs, as long as the family can handle the level of activity required. This is a good watchdog and may readily fight other pets. Care: The American Staffordshire Terrier needs dead and loose hairs removed regularly with a rubber brush.Coat care is minimal. Training: This breed is quite willful, so must be trained proper leash behavior at an early age. With the right approach, this dog can be well-trained on a variety of skills. 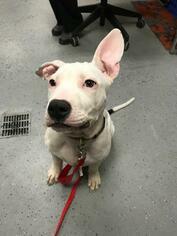 Activity: The American Staffordshire Terrier needs a lot of exercise and appreciates a big hard to run and play.As one of the breeds popularly considered a "pit bull," public acceptance may sometimes be low. Health Issue: This breed is usually healthy, but may be prone to hip dysplasia, cataracts, or congenital heart disease. 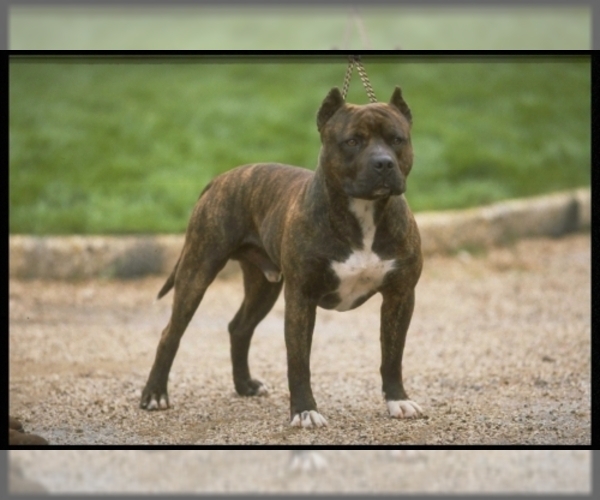 Posted Breed: American Staffordshire Terrier (medium coat). Posted Breed: American Staffordshire Terrier / Vizsla (short coat).